And it was literally like that. I spent a couple of days in Madrid, amazing city full of history, parks, nice people and of course very good food. Since my time was quite limited, I decided to spent 24 hours in the center of Madrid and enjoy every single dish that was put infront of my eyes. Thank you to my friend Flor (who is a local Madrileña) I had a chance to try very typical dishes from Madrid and spent a very nice time where Madrileños hang out and enjoy, tapas, cañas (beer), jam and more. 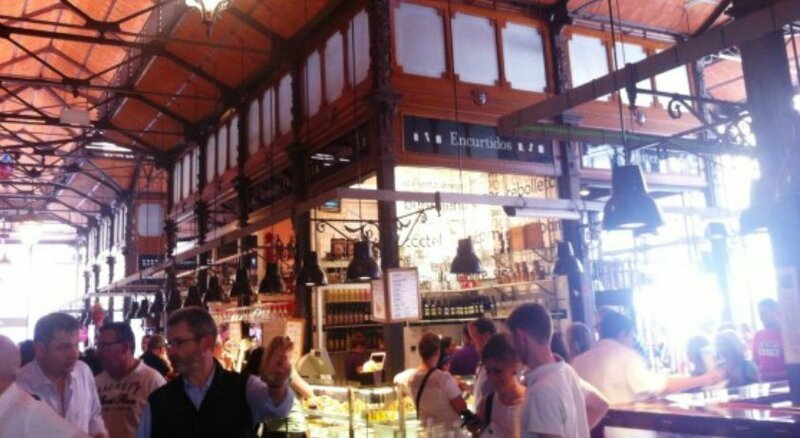 From its architecture to the food and people, el Mercado de Madrid is one of my favorite places in the city. Located in the city center of Madrid, the San Miguel Market just a walking distance away from the Plaza Mayor, this market was built in 1916, renovated and re-opened in 2009 with very modern shops inside but keeping its original metal structure on the outside. We arrived in the afternoon to this market with our stomachs ready to enjoy plenty of typical dishes from Spain. We started with an appetizer with some delicious white wine and different kinds of cheese, including the most famous one, Manchego cheese. After that, we decided to have a walk around the market, the atmosphere is super nice, people eating and enjoying all kinds of sea food, paella and jam. Then we did our second stop in another stand where we tried the typical croquettes: These are made out of Béchamel sauce, egg and bread – croquettes are just amazingly delicious! I recommend you to try many different ones – these are filled with chicken, Serrano ham, Champignons and more. Not really full yet, we stop in another stand and ordered “Gallega Octopus or Pulpo a la Gallega”. Pulpo a la gallega is a typical Spanish Galician dish which consists of slices of boiled octopus and sprinkled with paprika and salt. I was a bit skeptical at first about this dish but I must say it was very good. Gambas a la plancha: the most delicious dish in all the market (at least for me)! It is simply a plate with fried shrimps sprinkled with salt. Perfect summer dish and of course accompanied with a glass of white wine. If you are one of those who love all kinds of jam, then I highly recommend you to try different tapas with Chorizo, Jamon Serrano and more. They also have snacks to take away so you can take it home and prepare some Spanish tapas for you. Opening times: 10:00-24:00, from Monday till Wednesday and Sunday. And from 10:00-2:00 a.m. from Thursdays till Saturday.